The world’s first and most-famous/infamous “dead mall”. 800,000 square-foot enclosed shopping center with three anchors and two sub-anchors. Plagued by violent crime throughout the 1970s and shuttered in 1978, with the last stores gone early in the following year. 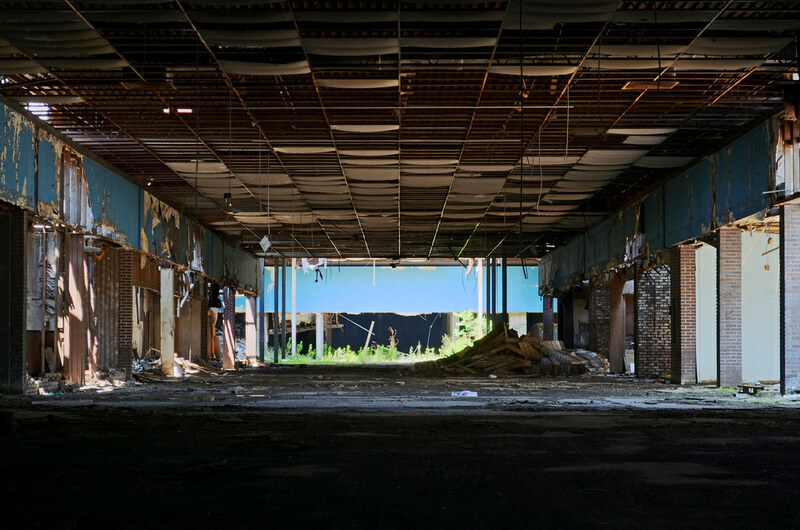 Interior destroyed and never repaired in mid-1979 when a car chase for The Blues Brothers was filmed both around and in the mall – which had been “dressed up” to appear open for the movie. Ravaged by scrappers and vandals over the following decades, sold and partially-demolished in 2005/2006, and finally finished-off in 2012. Loot: 1965 construction photos, letters to & from a purse-snatching victim, BankAmericard sticker from TurnStyle, site plans and blueprints, management documents, Thom McAn neon sign and countless other artifacts I’ve not yet published.